The kitchen is totally new and very comfortable there is a stainless steel Bosch cooker witch electrical oven and a big Bosch refrigerator ,and all kinds of domestic equipment to make your cookings easier , if you are going to cook your home cooking meals of course.Outside there is a space to clean and wash your vegetables , meats and fish. Colourfull and tasty meals how you like it. 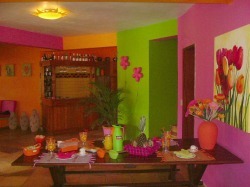 The colourful ambiance off Casa Kariri gives your breakfast lunch, or dinner an extra dimension, that's for sure! 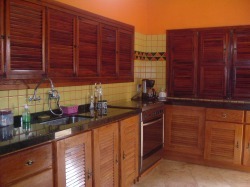 Whenever you want to use your meals in or outside the house the ambiance of warm tropical colours give them something extra! There is space enough for a whole family or for your private party! How about celebrate your birthday and let your invate people stay and give them in the morning a good breakfast.